RESNET HERS Rater (Home Energy Rater) Get qualified to perform energy ratings for Energy Star, LEED® for Homes and various regional programs and to work with home builders and architects to design energy efficient homes. RESNET Combustion Safety & Work Scope Required for HERS Raters to maintain their Rater Certification. Earn 12 BPI CEU Learn how to conduct a walk-through assessment of a home's general energy performance and make basic recommendations for improvements or further analysis. 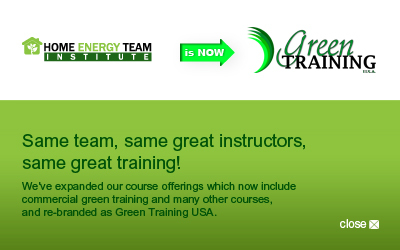 Earn 4 BPI CEUs Gain credibility and knowledge about energy efficiency with this respected company certification.